A folding rule whose principal function is measuring horizontal angles, with two flat arms connected by a two-leaf hinge, with a semicircular degree scale 0 to 180, divided to 10, subdivided to 5 and to 1, numbered by 10. There are two slit sights on each arm, the far sight on the moving arm folding into an aperture, the others being fixed. Positions on the scale are marked for the internal angles of polygons from 3 to 12 sides. The face of the hinge also accommodates a suspension point, target line, restraining bridge and a shaped slot to accommodate a plumb-line and bob. One quarter of the hinge has a geometrical quadrant scale ('Scala Altimetra') on a quadrant arc, 0 to 12 to 0, divided to 1, subdivided to 1/2 and to 1/4, numbered by 1. The fourth quarter has a compass with a target line offset for variation, a scale of 32 segments, each divided by 3, and named cardinal points. 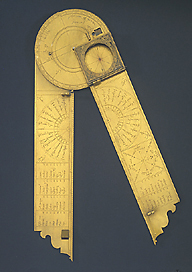 Above the compass is an equinoctial dial with a hinged hour circle adjustable by a hinged strut set by a latitude scale, and with hour lines 1 to 12 twice. The two rules have shaped points, and the inner edges have similar scales 20 to 100, divided to 10, subdivided to 5, to 1 and to 1/2, numbered by 10. Next to the hinge, and divided between the two rules, is a circle of 32 named winds, with the equivalent angles given in degrees. One arm has a regiment of the north star for eight directions named in Dutch. A table of latitudes extends over both arms. The reverse has a scale for 'Mensura unius pedis Antuerpiansis', 1 to 11 'digitus', divided to 1, numbered by 1; scales for iron and lead shot, and a monogram that may combine A and T, with B and I.